This ninth volume of the acclaimed series of ‘Psalms from St Paul’s’ presents a further five ‘sessions’ of the Pslams as they are sung each month in our great cathedrals. As in previous issues, the chants adopted incorporate the new alongside old favourites. Full texts are provided, with biographical details of the composers represented. The Psalms have been sung to the glory of the all holy, transcendent God in temple, synagogue and Christian church for century upon century. Though piously described as The Psalms of David in The Book of Common Prayer, we can doubt personal Davidic authorship without questioning that many Psalms date back to the early years of the Israelite monarchy and in their original form were used in the worship of the First Temple at Jerusalem built by King Solomon just over nine hundred years before the birth of Jesus Christ. From the beginning, most of the Psalms were probably composed for choral use with instrumental accompaniment. The Greek psalmoi means ‘songs accompanied by string instruments’. Vestigial choral and orchestral directions are still to be found in the Psalter as printed in the Bible. The ‘rubrics’ preceding Psalms 75 and 76, for example, are addressed to the choirmaster and tell him which tune to use or that the psalm should be accompanied by strings! The worship of the Christian Church grew out of the Synagogue and Second Temple in which the Psalter remained central. Peter and John, we hear in the Acts of the Apostles, went ‘up to the Temple at the hour of prayer, the ninth hour’ (3:1). It was the normal practice of Paul to attend the Synagogue on his missionary journeys (17:112). Jesus himself regularly shared in the worship of the Synagogue (eg Luke 4). Our Lord and his Apostles therefore used the Psalms as an essential part of their regular corporate worship of God. St Mark notes that Jesus and the Disciples sang a hymn after the Last Supper (14:26): this would have been the Hallel; Psalms 113 to 118 sung as a whole at the great Jewish festivals, but particularly appropriate to the Passover because of Psalm 114, When Israel came out of Egypt. The Psalms were also part of their personal vocabulary of prayer. Jesus echoes Psalms 22 and 31 in his words from the Cross: “My God, My God, why hast thou forsaken me” and “Into thy hands I commend my spirit.” The Passion narratives as a whole contain frequent references to the Psalms. In using the Psalter in the services of the Church we are therefore at one with those who have worshipped the one true God for almost three thousand years. And we are at one with the Lord of the Church, Jesus Christ, for whom the Jewish Psalter was a treasury of familiar liturgical hymns and a vehicle of prayer at the deepest moments of suffering. Over the centuries, Christians have indeed seen the Psalms as the prayer of Christ and our use of them as uniting us to him. St Augustine of Hippo (died 430AD) tells us that the Psalms are the voice of the whole Christ, head and body. In the Psalms, he tells us, Christ “prays for us and in us and we make our prayer to him. He prays for us as priest, he prays for us as head and we pray to him as our God” (Enarrationes in psalmos 85, i). For all the Fathers of the Church, Christ was mysteriously present in and through the recitation or singing of the Psalms. For this reason the whole Church has always made the Psalter a major part of its official prayer, most especially the offices of Morning and Evening Prayer, by whatever name they have been known, and in whatever language they have been said or sung. For this reason, through singing the Psalms we are not only joined to Christ but also with Christians throughout history and throughout the world today as each morning and evening the Church offers its one sacrifice of praise. Admittedly, some Psalms do not seem particularly edifying as instruments of prayer. The blessing of those who beat the brains of a Babylonian baby against the stones seems less than Christian (Psalm 137:9). One solution is to omit such verses, as do the modern Roman Divine Office, and the Alternative Service Book of the Church of England. At St Paul’s Cathedral my predecessor as Precentor, Canon John Collins, edited the Psalter in this way, in part following the excisions of the Proposed Prayer Book of 1928. Another solution was advocated by C S Lewis, who not only argued that we must see the Psalms in their historical and often primitive setting but also that the same feelings of resentment and revenge are also found in our hearts. It is best that the whole of us is brought to God, not only in praise and thanksgiving, but also even in frustration, anger and eventual penitence, rather than trying to hide our true self from God, our neighbour, or ourselves. Lewis says: “we are, after all, blood brothers to these ferocious, selfpitying, barbaric men” (Reflections on the Psalms page 26). The St Paul’s Cathedral Psalter allows either excision or use of these ‘imprecatory psalms’. Another apparent problem for moderns is the fact that the God of the Psalms is very much a God of nature and a God of battles: ‘Let God arise, and let his enemies be scattered … magnify him that rideth upon the heavens’ (Psalm 68: 1, 4). We, on the other hand, have largely lost the sense of God’s transcendence; that is to say, God’s otherness, his lordship over all creation and our total dependence upon him for the whole of our existence. Modern western man has come to regard God as subjective rather than objective; at best a fulfilment of religious emotion and aspiration. Or God is recognised only in the horizontal, human plane of our interpersonal relations. Note the songs and choruses of recent decades which point to God-in-our-neighbour. True as this is, it is not the whole truth. For the Hebrew mind, God is always the author of all that is and everything that happens. If, on the contrary, we permit the idea of God to be reduced to our emotions or even to the service of others, we devalue ourselves and our neighbour. Only a transcendent Creator can give transcendent worth to his creatures. If we are really all that is, man has neither meaning, purpose nor destiny. The Psalmist’s science may be primitive; his sense of God in history somewhat interventionist; but his emphasis on the involvement of God in the natural processes and in human history redeems us from the bleak alternative of nihilism. But how do we use the Psalms liturgically? When Archbishop Thomas Cranmer translated and adapted the Medieval Service Books he spread the Psalter over a month rather than a week. The Roman Divine Office followed suit after the Second Vatican Council. The Alternative Service Book spreads the Psalms to five times a year. At other times in Christian history other permutations have been devised. In some monastic communities the whole Psalter was said or sung in one day! Only recently, however, have scholars come to ask radical questions about the principle of using the whole Psalter in its biblical order, recitatio continua. In fact this was not how the Psalms were used in the earliest daily choral office. This so-called ‘Cathedral Office’ used a selection of Psalms based on the liturgical season, the time of day (morning or evening), or a daily call to praise by the use of Psalms 148-150 which went back to the Synagogue itself. The developing monastic communities in East and West subsequently invented the continuous recitation of the Psalter and this eventually displaced the earlier thematic system almost everywhere. In recent months an office book has been published with the encouragement of the Liturgical Commission of the Church of England which reintroduces the principle of thematic psalmody (Celebrating Common Prayer, Mowbray, 1992). The sensitive extension of thematic psalmody, even if it does not replace continuous psalmody entirely, would be a great enrichment of liturgical provision for cathedrals and parish churches. The present St Paul’s usage remains as in The Book of Common Prayer; though mornings and evenings are alternated each month so that the whole Psalter is sung at Evensong over a two-month period. The St Paul’s Psalter makes no apology for the continued use of the Prayer Book version of the Psalms, itself almost identical with that of the Psalter in the Great Bible of 1539 translated by Miles Coverdale. Modern versions are of great value in discovering the meaning of the Hebrew Psalms, where the old may be obscure, but they cannot compare with the euphony and poetic beauty of Coverdale. Anglican use of newer translations for the choral recitation of the Psalter is very rare indeed and it is surely appropriate to use the texts for which most of the chants were actually composed. Moreover, Coverdale translated his Psalter from the Latin rather than the Hebrew. At first sight this may seem a disadvantage. But this traditional Latin text was based upon the Greek version of the Psalter and consequently reflects a much earlier (and in some places more authentic) Hebrew text than that now extant. Conservatism in translations of the Psalter is notorious. When St Jerome translated the Hebrew Psalter for the Vulgate it was never fully accepted for liturgical use because the earlier Latin version, based on the Greek Septuagint, was already treasured and memorised. The Psalms have always been sung. When Jesus read the prophecy of Isaiah in the Synagogue (Luke 4) he probably used a ‘cantillation’ which a modern Jewish cantor would still recognise today. Contemporary Jewish free-rhythm chants are clearly related to the ‘modes’ found in Byzantine and Western plainchant. All derive from a common stock. Anglican chant, itself originally a harmonised variant of Western plainsong, can thus be seen to be intimately related to the wider tradition of the singing of the Psalms by Jew and Christian. Though it should be remembered that such harmonisation of plainsong is not exclusive to England or Anglicans! 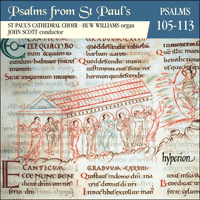 A novel advantage of the recording of the whole of The St Paul’s Cathedral Psalter on CD will be its availability not only for aesthetic listening but also its devotional use. Individuals or small groups of priests or lay people can say the offices of Morning and Evening Prayer and listen meditatively to the Psalms as sung in St Paul’s. In commending The St Paul’s Cathedral Psalter I can do no more than say that the day-by-day experience of Evensong, sung by the Choristers and Vicars Choral of St Paul’s, using this Psalter as it has evolved experimentally over the years, has not only deeply enhanced my appreciation of the Psalms within the context of the ‘common prayer’ of the Church but also convinced me that, done well, there is nothing to match the beauty of the best of Anglican chant. Anglicans possess here a unique blend of objectivity and emotion. I believe The St Paul’s Cathedral Psalter will be a valuable instrument for the performance of Anglican chant, and also a means by which the Church will more truly know that Christ prays for us and in us and we make our prayer to him’. When it was first published in 1875, The Cathedral Psalter, edited by Sir John Stainer and others, provided the standard to which others aspired, both in publication and performance. Now, over a century later, the tradition continues and history is repeating itself. St Paul’s Cathedral has published an entirely new version of its famous Psalter, with the familiar words of The Book of Common Prayer freshly pointed by John Scott, the Cathedral’s Director of Music, and a wide selection of chants is brought up to date with the addition of many new ones set alongside well-known favourites. In the Anglican choral offices of Mattins and Evensong the singing of the allocated portions of the Psalter on a daily basis to Anglican chant provides for many people the spiritual backbone of this continuum of worship. The Book of Psalms encompasses the whole gamut of human emotion: not only joy, praise, love, hope and faith, but also sorrow, despair, fear, penitence, aggression and revenge. Heard at its best in the ambience of a great cathedral, with the added visual bonus of magnificent architecture and with the standard of performance associated with our cathedral and collegiate choirs, Anglican chant assumes a significance and inspiration for the listener which readily identifies it as an integral part of worship. He hath not dealt with us after our sins, nor rewarded us according to our wickednesses. The ungodly borroweth, and payeth not again, but the righteous is merciful and liberal. Our soul is filled with the scornful reproof of the wealthy, and with the despitefulness of the proud. Before the emergence of the Oxford Movement in the first half of the nineteenth century, the pointing of the Psalms for use with Anglican chant was a rare practice other than in cathedrals. Indeed, one of the many upheavals effected by the Oxford Movement was that of the fully choral service which became widespread, especially in the larger parish churches. Some method of indicating to choirs the portion of the verse to be recited and the portion to be inflected became necessary. J C Beckwith, organist of Norwich Cathedral, wrote in 1808: “Suppose the organist and choir were to meet every morning and afternoon for one month, and agree on the proper place in each verse of the psalms, where the reciting should end in both the first and last parts of the chant, and under that particular word or syllable place a conspicuous red mark; if one book were thus marked, the others might be rendered similar to it. The benefit would be, all the members of the choir might recite as one person, and all come together to that word which they are previously sure is the most proper to end the recital” (i.e. the recitation). The first such attempt to present in printed form a method of pointing appeared in 1837, edited by Robert Janes, organist of Ely Cathedral. Since that period, almost innumerable pointed versions of the Psalms and Canticles have appeared, with a considerable variety of methods of indicating the allocation of the syllables to the notes. Of these The Cathedral Psalter (1875), edited by Stainer, Barnby and others, long held the most prominent position. However, a radical change in approach to pointing took place following a pamphlet written by Robert Bridges in 1912. Its contents were to be of profound influence in that the author sought to emphasise the supremacy of the words around which the chant must be fitted. It was his decree that the verbal accents correspond with the musical ones. As a result of this, new psalters began to appear in profusion, all paying allegiance to the ‘speech rhythm’ method of ‘pointing’, as it became known. The most significant and enduring of these proved to be The Oxford Psalter (1929) edited by Ley, Roper and Hylton Stewart and The Parish Psalter (1932) edited by Nicholson. It is said that Dvorák, on first visiting England and hearing a Psalm sung in St Paul’s Cathedral, asked, “Why do they sing such a bad tune over and over again?”. Not every chant can be said to be remarkable, many being drab or banal in the extreme. Despite some excellent twentieth-century additions to the chant repertoire, the Anglican chant is probably seen at its best in a surprisingly large number of eighteenth- and nineteenth-century examples in which basic, coherent harmonies support concise melodic lines. The Anglican chant is in essence a miniature, and a challenge for any composer to imprint a characteristic stamp on the form. As well as being musically satisfying, a chant must be more than capable of enduring constant repetition during the course of a single Psalm. These qualities are the more necessary when the chant is reflected against the background of its particular function, that of being a vehicle for the spoken word. The feebleness of a poor chant becomes increasingly irksome the more it is heard repeated. In compiling The St Paul’s Psalter, the editor has not only drawn upon material from the various chant collections to have been used previously in the cathedral, but the opportunity has also been taken to include chants from other sources, in addition to more recently composed examples. The process of revision and compilation was initiated in 1985 and in the ensuing years successive Choristers and Vicars Choral at St Paul’s have worked with various prototypes of the finished product. I am grateful to them all for their patience and much perceptive, informed and relevant comment. Finally, there is bound to be a degree of personal choice in both the selection of chants and pointing of the text. Good pointing will always mirror the meaning of the words; it will never distort it. Any shortcomings in this area must inevitably be mine, but I am indebted to a number of people for past inspiration, vision and insight, namely Jonathan Bielby, George Guest, Harry Bramma, Barry Rose and Christopher Dearnley.